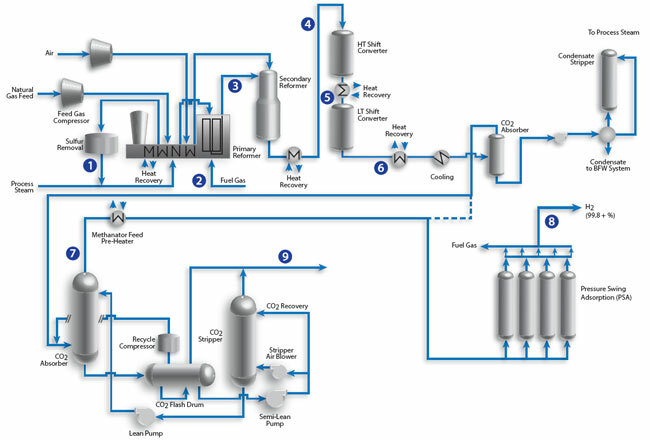 A typical modern hydrogen-producing plant using natural gas as primary feedstock converts the natural gas in a steam methane reformer to syngas, which is a mixture primarily of H2 and CO. The CO is then converted into additional H2 and CO2 in Water-Shift reactors. When recovery and sequestration of CO2 are required, further processing purifies the syngas by removing CO2 via a CO2 absorber. There are several streams that are typically analyzed in real-time during hydrogen manufacturing, and the analysis results form the basis for controlling and optimizing the main process units. Although most of the streams are relatively easy to analyze using traditional on-line analyzer techniques, in some cases steam content and the process conditions are severe enough to require special sample conditioning techniques. The Optograf™ Gas Analyzer and integrated sampling interfaces address these sampling challenges.